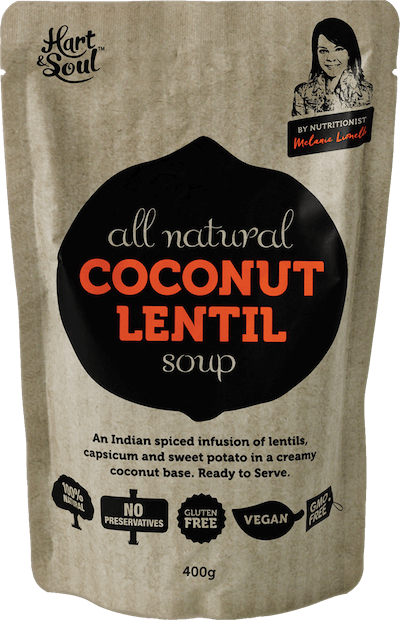 An Indian spiced infusion of lentils, capsicum & sweet potato in a creamy coconut base. Serve garnished with chopped coriander, a side of flat bread and natural yoghurt. Water, Coconut Extract (25%), Lentil (11%), Capsicum (7%), Sweet Potato (5%), Mung Bean, Onion, Salt, Spices (1%), Coriander, Chili, Cumin, Cardamom, Turmeric, Garlic. May contains traces of Crustacea, egg, fish, peanut, Soybean, Sesame and Tree Nuts. Like Hart & Soul, Melanie Lionello understands the need for her recipes to combine taste with real, nutritional value. Her creamy and rich coconut lentil soup creation is the perfect example of her belief that health doesn’t have to compromise taste. Melanie Lionello believes more than anything in the power of Soul food.